At the age of fifty-seven, HR manager Alain Delambre finds himself more on less on life’s scrapheap: made redundant four years previously, Alain has struggled to find suitable work in an extremely competitive market, taking whatever work comes his way so that he and his wife can get by and pay the bills. When Alain finds what looks – on paper – like the perfect job, he decides to do everything in his power to load the dice in his favour: borrowing money from his children; lying to his wife; hiring a private investigator to get information on the people involved in the interview. The recruitment process is an unusual one: a role play that takes the form of a hostage taking. But when Alain learns that he’s been invited along to make up the numbers – that the job has already been promised to someone younger than him – things take a sinister turn, and those in charge soon discover that this role-playing scenario might be more realistic than anyone could have imagined. Alain Delambre’s situation is one that we all know: if it hasn’t happened to us, it’s happened to someone close to us. As a man in his fifties with a background in human resources, Alain knows – at least on an intellectual level – that hiring him will always be a difficult proposition. When the perfect job comes along, he is blinded to this fact, and convinces himself that he is the most likely candidate, invited for interview due to his advanced age and the corresponding experience it brings. He sees it as a way out of the half-dozen part-time jobs that have kept his head above water for the past four years and, more importantly, as a way to become what he considers as a useful member of the family again: the breadwinner, the provider. Pierre Lemaitre’s latest novel (or at least, the latest one to be translated into English) showcases an author at the height of his game. In story after story, Lemaitre takes us deep into the world that he has created and never fails to leave us slack-jawed with amazement as the story we think we’re reading turns out to be something completely different instead. Inhuman Resources is no exception, a simple story of one man’s search for employment becoming, after twist upon twist, a deadly game of cat and mouse where only the cleverest man is likely to come out on top. Told initially from Alain’s point of view, we watch as the potential job fills him with purpose again, giving us a glimpse of the man he was before redundancy. But as the days pass, and the prospect of a new job looms ever closer we find ourselves questioning Alain’s actions: borrowing €25,000 from his eldest daughter’s house-buying fund, money that we all know he has no hope of paying back before his daughter and her husband are due to sign for their new flat; the lies to his wife that are slowly but surely driving a wedge between them, and which he has no chance of covering up for long, even if he does get the job; assaulting his son-in-law (although there’s a grey area here: if you ask me, Gregory deserved everything he got). As the action moves to the fake hostage situation itself, Lemaitre switches focus to David Fontana, an ex-special forces soldier who has been tasked with organising the role play. Fontana is as surprised as everyone else when Alain takes charge of the proceedings, and takes Alain’s actions as a personal snub. A dangerous man, we are left in no doubt as to what happen to people who cross David Fontana. Reverting back to Alain Delambre for the final third of the book, Lemaitre takes great delight in piling layer upon layer onto this already complex story, as Alain and Fontana try to outsmart each other, the one trying to stay alive while the other tries to get his revenge. With each chapter, he ratchets up the tension until the edge-of-the-seat climax involving a high-speed car chase along the busy Parisian streets. There is a light-heartedness to Inhuman Resources that is often used to direct our attention from whatever sleight of hand Lemaitre is attempting to pull. While we can empathise with Alain Delambre, it doesn’t take long for us to take a step back, to distance ourselves from this man who is clearly disturbed. Yet after spending time in David Fontana’s head, we can’t help rooting for Alain, regardless of what he has done, or on whom he has trampled in his quest for employment. As with much of Lemaitre’s work, there is much more to this story than meets the eye at first, and it is difficult not to admire the author for his ability to turn the world on its head, and make us question everything we think we’ve seen. 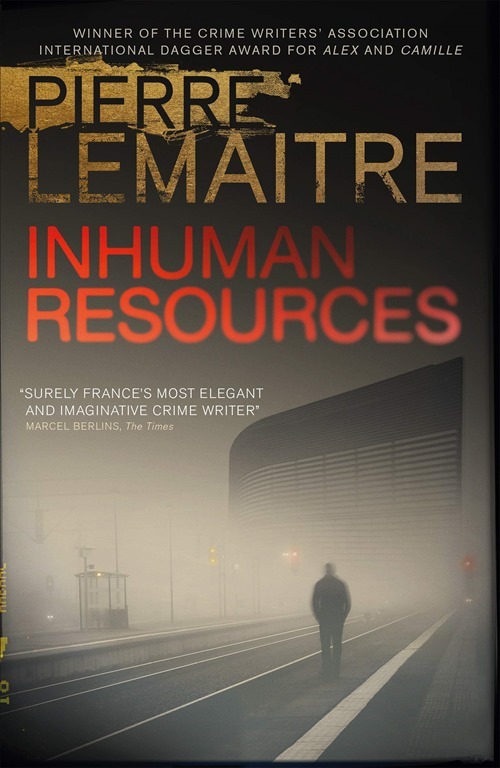 The latest in a long line of must-read novels from Pierre Lemaitre, Inhuman Resources shows a master storyteller at the top of his game. Surely France’s most exciting – not to mention most eloquent – author, Lemaitre continues to produce some of the finest crime fiction to appear in the past decade. Ably translated by the always-excellent Sam Gordon, this is the perfect read for the long nights ahead and one of the finest novels – of any genre – that you’ll surely see this year.